Separate yolks from whites. Whip the egg whites with a pinch of salt. Continue mixing and add egg yolks and sugar. Mix in the flour and baking powder, then gently stir the dough with oil and vinegar using a spatula. Place the batter into a mold lined with baking paper. Place in the oven preheated to 180°C/356°F and bake for 20 minutes. Set aside for the cake to cool down. Peel the apples, cut into small pieces. Put them into the pot with the other ingredients. Fry briefly so that some apples start to melt, but some solid pieces still remain. Remove from heat and allow to cool. Cut the sponge cake lengthwise in half. 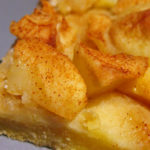 Place the apples on the bottom part, press the second piece of sponge on top. Leave for a few hours to let apples bind to the cake. Sprinkle with powdered sugar on top.